Early diagnosis and treatment has shown to lead to the best outcomes with mental illness. That's why the ability of speech analysis software to be able to predict psychosis in at-risk patients is an exciting breakthrough that could potentially make early detection a growing reality. A large majority of young people who are at risk for psychosis demonstrate a disturbance in flow of meaning during speech. Recent research has shown that a computer-based analysis of speech transcripts, obtained from interviews with at-risk youths, were able to predict which youths would later develop psychosis within two years, with an accuracy of up to 83%. The same computer-based language classifier was also able to predict psychosis onset in a second at-risk cohort with 79% accuracy. Taken together, the results from the study suggest that this technology has the potential to improve prediction of psychosis and other disorders. According to the National Alliance on Mental Illness (NAMI), psychosis is characterized as disruptions to a person's thoughts and perceptions that make it difficult for an individual to recognize what is real and what is not. These disruptions are often experienced as seeing, hearing, and believing things that others do not or having strange, persistent thoughts, behaviors, and emotions. NAMI says that some of the early warning signs leading up to psychosis include a worrisome drop in grades or performance, trouble thinking clearly or concentrating, suspiciousness or uneasiness with others, a decline in self-care, spending more time alone than usual, and strong or inappropriate emotions or having no feelings at all. Disorganized thinking is also a common symptom of psychosis and is typically assessed using an interview-based clinical rating of speech. Language is characterized by tangential (disturbance in flow of meaning) language, reduced complexity of speech, and looseness of associations. It is often subtle at first, but a computer analysis has shown it can detect these nuances. "It's actually quite amazing what the computer can pick up on," says Cheryl Corcoran, MD, an associate professor of psychiatry and program leader at Psychosis Risk at the Icahn School of Medicine at Mount Sinai in New York. "Each word can be assigned a semantic vector, which captures its meaning. A vector is like an arrow and has a direction. The words 'cat' and 'toothbrush' rarely occur together, so their semantic vectors point in different directions. A sentence is a group of words, so a sentence semantic vector is the sum of all the word semantic vectors, and itself has a direction—and meaning—that reflects the word semantic vectors. "In speech, one sentence follows another," Corcoran continues. "So you can see if successive sentence vectors tend to be pointing in the same direction or not. When someone changes the topic abruptly, the new sentence will have a different direction from the preceding one, and the cosine of the angle between the successive sentence vectors will be closer to negative one than to one, which means it is less coherent." In fact, Corcoran says that computers are even more precise and can pick up on very subtle disturbances in language. "Given its precision, a computer program or algorithm can pick up on something that we may sense is not entirely normal, but that without the right training, could be overlooked," Corcoran says. Some of the findings in teens and young adults exhibiting signs of risk for psychosis were that they had less semantic coherence and their speech was less complex. Their sentences were shorter, and they had fewer dependent clauses, which are clauses that begin with words such as "which" or "that." Corcoran says they also found some abnormalities with possessive pronouns. The ability for a computer to recognize these differences is exciting in terms of early identification and intervention of psychosis. "If we can improve our ability to determine who is truly at risk for psychosis, and who is a 'false positive' that we mistakenly thought was at risk, then we would know better who should get preventive interventions and treatment," Corcoran says. "Also, if subtle language impairment is an early feature of emerging psychosis, then perhaps we can try cognitive remediation to try to prevent psychosis onset. It's an area we're still exploring." The best treatment options for psychosis risk are still under evaluation, but Corcoran says that the most promising option appears to be cognitive behavioral therapy for psychosis, or CBTp. The goal of CBTp is to reduce symptoms and distress by changing beliefs about the symptoms and improving one's coping skills. Yulia Landa, PsyD, MS, an assistant professor and director of CBT for the Psychosis Research and Clinical Program at Icahn School of Medicine at Mount Sinai, has been doing research in this area. Landa says that anomalous experiences, such as hearing a voice when there is no one around, can cause increased stress, if they are perceived as threatening. Studies show that stress can exacerbate symptoms and increase the intensity of anomalous experiences, for example, making the voice sound louder. CBTp focuses on normalizing such experiences and helping people form more adaptive appraisals, preventing further distress. "It's so important that we help normalize patients' experiences and let them know that they are not alone. For example, about two to five percent of the population experiences voice hearing," Landa says. "One very famous person, actor Anthony Hopkins, is a voice hearer and he manages his experiences very well. By explaining this to patients, we help to normalize their situation." "When peoples' beliefs seem strange or implausible, as providers, it is our job to try to understand how these beliefs were formed, as there is always some logic behind it," Landa adds. "Being able to show a person that we understand is key in helping them to feel better and to feel comfortable sharing with us." Landa says that the research being done with speech analysis may be helping to pave the way for increased early intervention. "If we are able to identify at-risk patients, or even predict those who may already be transitioning into psychosis, then we can start treatment sooner," Landa says. "Early intervention has been shown to make a difference in outcomes. We can also use CBT strategies to help at-risk youth to express themselves by making their speech patterns clearer. We are not yet sure if this can prevent psychosis, but at the very least [it] will help the individual to be better understood, which can help them to build relationships and achieve their goals." While computer-based speech analysis presents some exciting opportunities, it's in no way a replacement of a real-life therapist. Corcoran says it's important not to interpret this research, and these advances, as a threat in that way. "You simply can't replace human relationships with a computer," she says. "This is a tool. In my training, I learned from experts across disciplines, including psychiatry, psychology, and social work. I was particularly impressed by my social work mentors, and the way that they appreciated and fostered systems of relationships for patients." But Corcoran says that this technology could be a support to what social workers and other providers are already doing. After all, there are only so many clinicians out there and they can only see so many people in a given day. However, the computer can process much more data—and much more quickly—in a way that it could facilitate additional support by assisting in characterization of symptoms and impairments. This can be extended beyond language structure itself to include prosody and tone of voice, face expression, and body language. "There are certain interactions which occur in a face-to-face meeting with a clinician which a computer will likely never learn," Corcoran adds. "So, they will never fully replace human interaction. However, artificial intelligence can help make sense of behaviors and symptoms that patients have, including young people at risk for psychosis, but also more broadly across psychiatry and even medicine." Considering social workers are often on the front lines of working with at-risk populations, it's quite possible they may be one of the first providers to recognize the early symptoms of psychosis. Landa says for this reason, it's quite helpful to know the differences between what full-blown psychosis looks like and what is just an early sign. Early warning signs, as discussed previously, include speech disturbances, among other symptoms. Full-blown psychosis, on the other hand, can include a range of symptoms but typically involves one of two major experiences—hallucinations (seeing, hearing, or feeling things that are not there) and delusions (strong beliefs that are not consistent with the person's culture, are unlikely to be true, and may seem irrational). 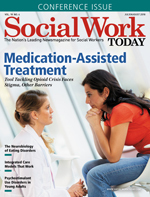 Landa adds, "If a social worker were to be interacting with patients who might be having psychoticlike experiences, it's most important that they are empathic and make every attempt to truly understand their experience."